Vally carpenter bee, Xylocopa varipuncta, nests in apple. Each gallery is about one-half inch across. We have a section of an old apple tree at the Haven that is being used by Valley carpenter bees, Xylocopa varipuncta, as a nest. I've included a picture here; the number and size of the galleries the bees have excavated is quite impressive. While entomologists generally don't regard carpenter bees as major pests -- they provide valuable pollination service -- that's a tougher sell among the general public. In fact carpenter bee damage is so noticeable that they are often blamed for tree damage done by completely different insects. 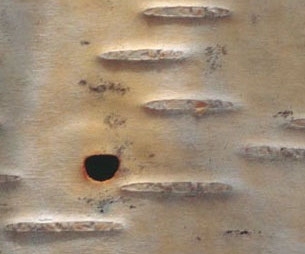 Bronze birch borer, Agrilus anxius, exit hole in white birch. Notice the 'D' shape of the hole, which is about one-quarter inch wide, that is created by the insect's flat head. At a recent outreach event I spoke with someone who described the damage carpenter bees had done to his trees. When he told me he didn't remember the name of the tree but that it had white bark, I immediately knew that bees were not to blame. Borers and white-barked trees generally mean only one thing: bronze birch borers, Agrilus anxius. These insects are in the family Buprestidae, the flat-headed borers. 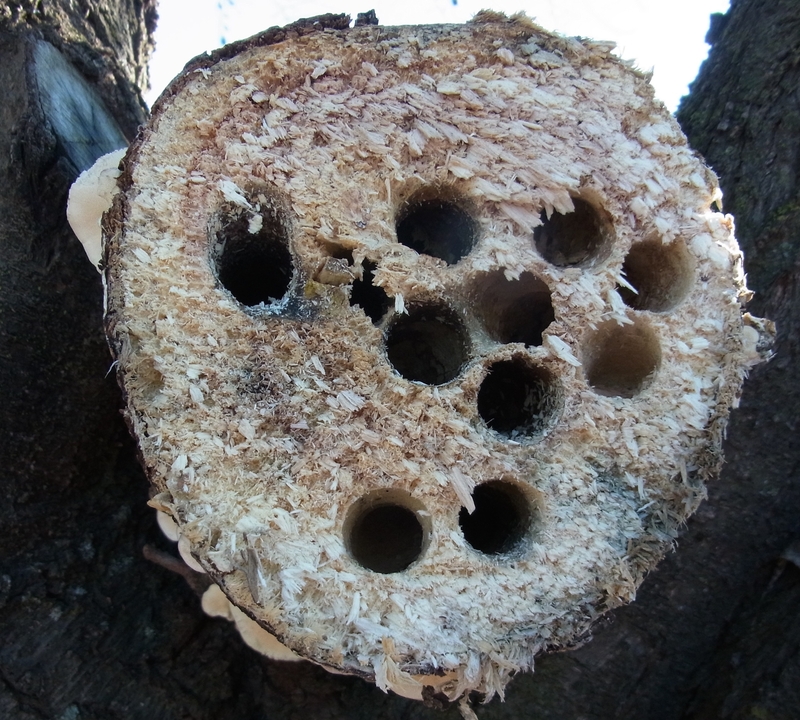 Borers spend much of their life cycle underneath tree bark excavating galleries in which the larvae develop. As the name suggests, one side of the head is flat, so the borer creates a D-shaped exit hole as it leaves the tree as an adult. European white birch, Betula pendula, is widely planted in the Sacramento area. It is a riparian species that did well before water metering and drought led homeowners to restrict lawn watering. The past several years of dry weather have focused careful attention on landscape water use; unfortunately borers tend to attack drought-stressed trees. What are some bee-friendly small trees that can be substituted for birches? 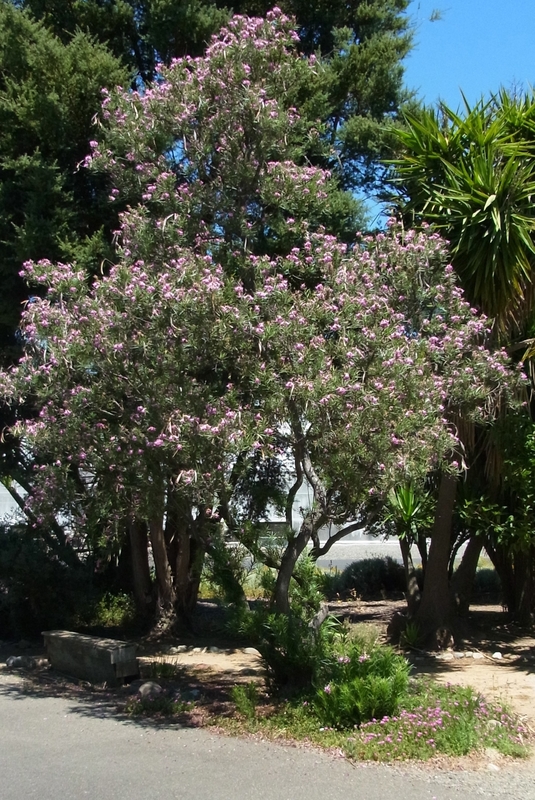 There are two small trees that do well in much of California under low water regimens and also provide for bees. I've mentioned the first, western redbud (Cercis occidentalis), many times on this blog. Its attractive flowers are in bloom right now, but this plant's primary value for bees is the foliage. Leafcutter bees use this tree's leaves for nest-building material, and we've planted it throughout the Haven to ensure an ample supply. It's a UC Davis Arboretum All-Star that reaches about fifteen feet in height and grows in full sun to light shade. 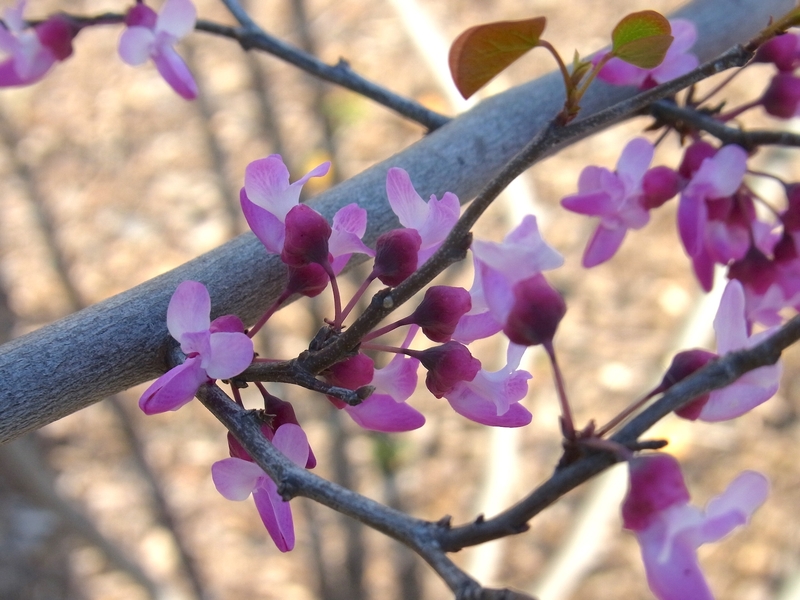 It tends to have a shrubby form but can be pruned into a tree shape. It also has interesting seed pods that persist through the winter. 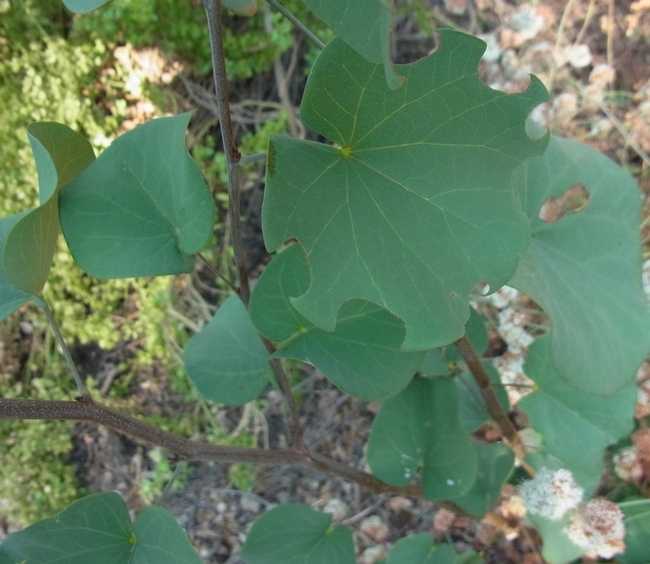 Leafcutter bee activity on western redbud, Cercis occidentalis. The female cuts a 'C'shaped leaf piece to cover each egg and its provisions. 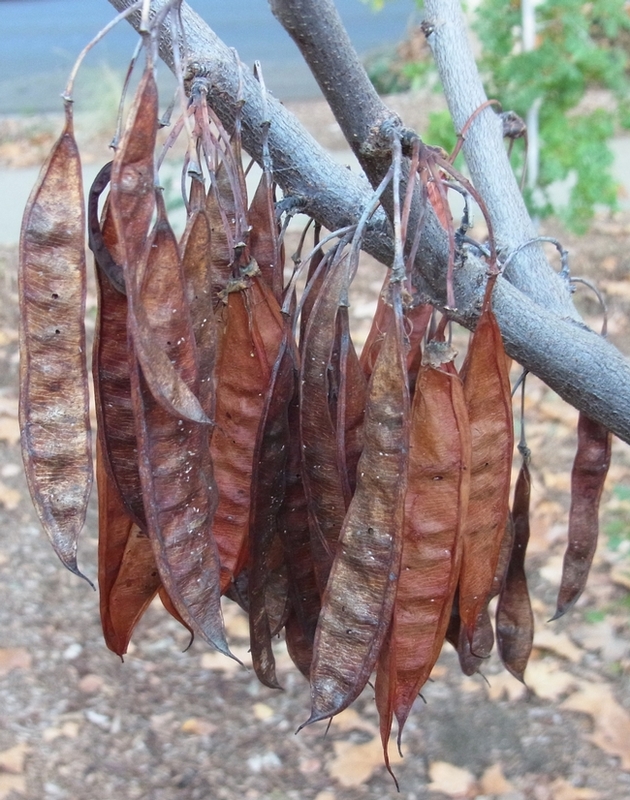 Western redbud, Cercis occidentalis, seed pods. Click on the image to enlarge and you'll see small holes in the pods, indicating feeding by a seed weevil. 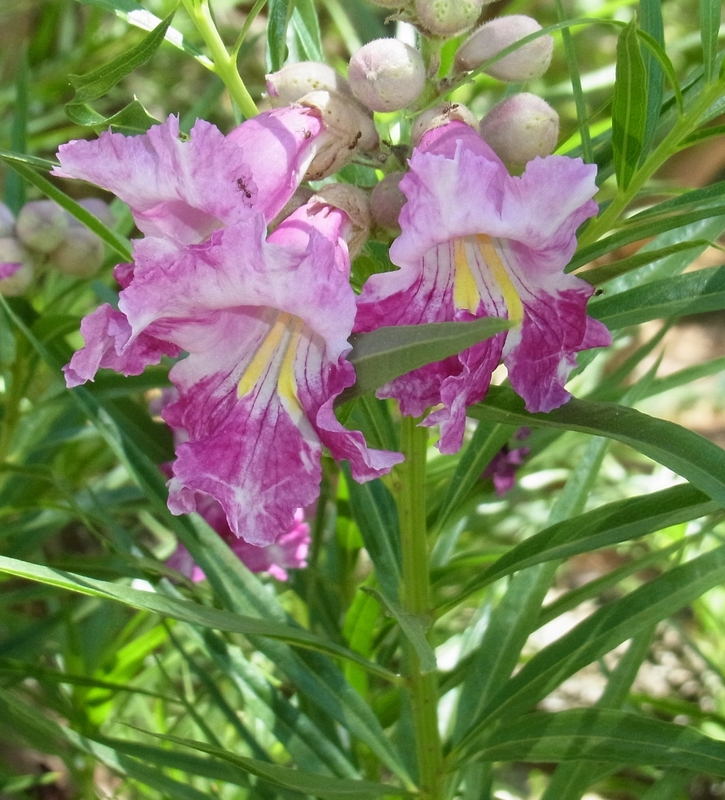 Another less common native tree that's also a great bee resource is desert willow, Chilopsis linearis. As the name suggests, it is native to the desert areas of California and does well in the hotter, drier parts of the state. The showy flowers of this fifteen to twenty foot tree appear in spring and continue on and off through the summer. Another small native tree is California buckeye, Aesculus californica. This one is noticeable because it loses its foliage in mid-summer as an adaptation to our summer-dry climate. Unfortunately this plant's pollen and nectar are toxic to honey bees, so it is not recommended for bee gardens. Can native bees use the CA buckeye pollen and nectar? Thanks for interesting article. Native bees can use California buckeye without any issues. Native bees evolved with this native plant so toxicity is not a problem. I attended the Open house for National Pollinator week. The garden is wonderful. I learned so much. Christine Casey gave a wonderful tour of the plants and handed out a list of plants that could provide continuous bloom for nectar and pollen. I am planning out a backyard garden and misplaced this list. I am wondering if it is posted online, or if you could send me a copy of the pdf? I would really appreciate it. And thank you so much for all of your efforts. Honey Bee Have is inspiring. thank you for the plant listing, I really appreciate it. =0) Deb S.